UNIST research team, led by Professor Tae Joo Park in the School of Life Sciences has identified potential therapeutic targets for arthritis treatment through the observation of facial cartilage formation in Xenopus embryos. Professor Park (right) and Professor Taejoon Kwon (left) on the front row are posing for a group photo in their lab at UNIST. Their findings have been published in Science Translational Medicine on October 11, 2018. Articular cartilages, once injured, cannot regrow or heal on their own. By understanding the mechanisms of how frog embryos develop to form facial cartilages, researchers have identified a novel potential therapeutic target that could pave the way for regenerative treatments for arthritis in humans. This breakthrough has been led by Professor Tae Joo Park and his research team in the School of Life Sciences at UNIST in collaboration with Professor Shi Young Yang in the Department of Medicine at Ajou University. Pharyngeal arches of vertebrate embryos develop to form various facial tissues including cartilage, bone, muscle, and other connective tissues. The pharyngeal arches of the Xenopus embryo provide accessible and tractable tissues to study the interplay among various tissues during cartilage formation. Through the study of Xenopus Laevis, the research team has identified, for the first time, integrin-β–like 1 (ITGBL1), a secreted protein involved in cartilage formation, plays a major role in the protection against osteoarthritis (OA) development in joint cartilage. Joint destruction in both rheumatoid arthritis and osteoarthritis occur when the soft bone marrow, that is, the cartilage that cushions the joints wears away. Unlike other self-repairing tissues, cartilage has a low regenerative capacity. It lacks vascular, neural, and lymphatic networks, as well as various local progenitor cells. For these reasons, it is challenging to restore full tissue function in damaged or diseased articular cartilage. To examine whether ITGBL1 is involved in cartilage development, the team knocked down Itgbl1 expression using a splice-blocking morpholino oligo (Itgbl1-MO) in Xenopus laevis embryos. They found that developing chondrocytes express integrin-β–like 1 (Itgbl1) at specific stages, inhibiting integrin signaling and promoting chondrogenesis. Unlike cytosolic integrin inhibitors, ITGBL1 is secreted and physically interacts with integrins to down-regulate activity. We observed that Itgbl1 expression was strongly reduced in the damaged articular cartilage of patients with osteoarthritis (OA). Ectopic expression of Itgbl1 protected joint cartilage against OA development in the destabilization of the medial meniscus–induced OA mouse model. Thier results reveal ITGBL1 signaling as an underlying mechanism of protection against destructive cartilage disorders and suggest the potential therapeutic utility of targeting ITGBL1 to modulate integrin signaling in human disease. “The unique function of ITGBL1 as a secreted integrin inhibitor points toward new approaches to treat integrin-mediated human diseases and destructive cartilage disorders,” says Professor Park. The findings of this research have been published in the online edition of Science Translational Medicine, the sister journal of Science on October 10, 2018. 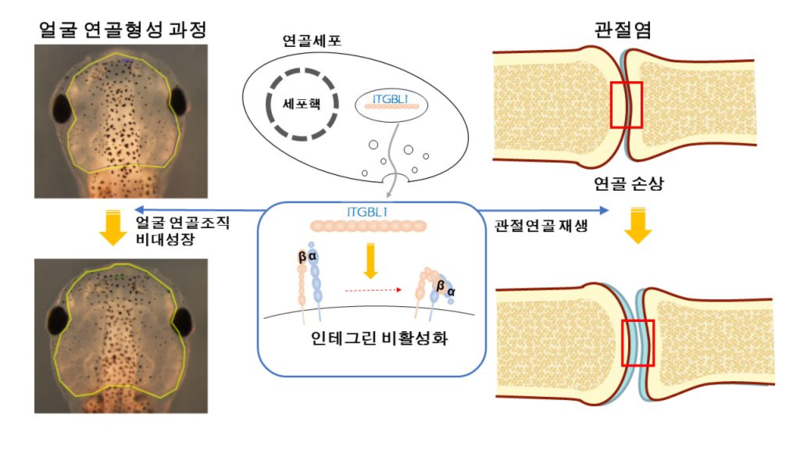 Eun Kyung Song, “ITGBL1 modulates integrin activity to promote cartilage formation and protect against arthritis,” Science Translational Medicine, (2018).